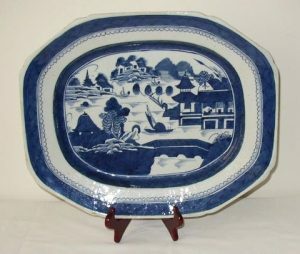 This category contains both English and Dutch Delft, Pennsylvania Redware, Chalk, as well as other ceramics. 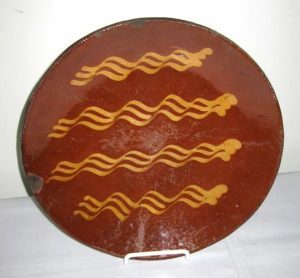 Large 19th C. Redware pie plate with cogged edge, 12″ diameter. 4 sets of 3 wavy line slip decorations. 2 edge chips are visible in photo with a very tight 1 1/4″ hairline emanating from the smaller chip. Also a couple of minor edge flakes, not unusual for these large plates. Slip lines in very good shape. 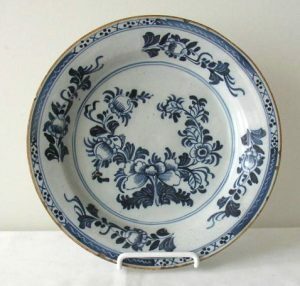 Large 18th C. Dutch Delft charger in the “Peacock” pattern. 12″ diameter and 2.5″ deep. Nice heavy form with good depth. 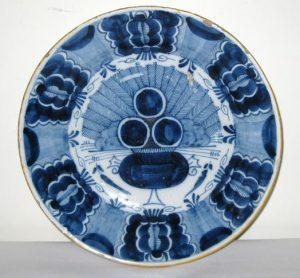 Rich blue and white decoration closed with a yellow rim. Marked with the signature of the 3 Bells Factory in The Netherlands. Fine condition with no hairlines, cracks or restoration. Minor production flaw @ 1:00. 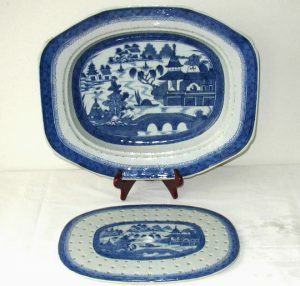 19th C. Canton platter with matching drip tray. It is in excellent condition with no chips or hairlines. 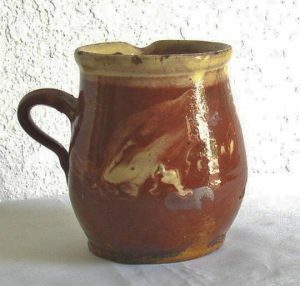 19th C redware handled jug with cream colored decoration over a reddish brown base glaze. 5 1/2″ tall. Overall very good condition with 2 tight 1″ hairlines at rim opposite the pouring spout. 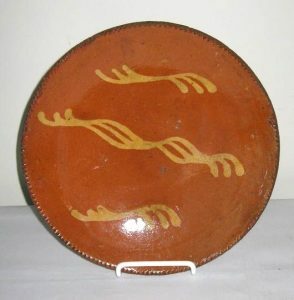 Probably Eastern France origin. 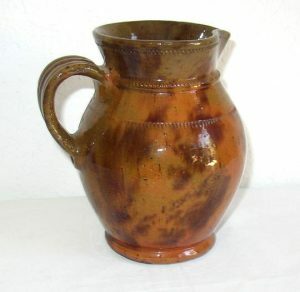 19th C, early 20th C. French/German Pitcher with free form slip tulips. Fine condition, 2 small base chips. 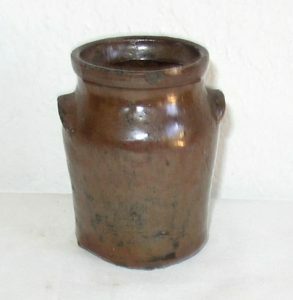 Crudely formed miniature stoneware jar with small applied ear handles and flared rim. Reddish brown glaze. Very good condition with only a small flat flake on the rim and minor roughness on the edge of the ear handles. 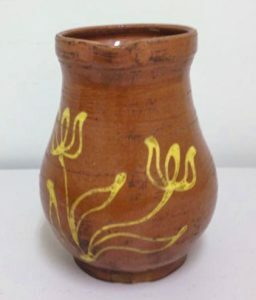 3 7/8″ high. Found near Albany, Georgia.